3.) You will NOT abuse glitches and bugs, but you will report them. 4.) You agree that all intellectual property or other rights in any game character, account and items are and will remain our property. 5.) You will NOT break the (T.o.S) OR the In-Game Rules therefore you must read both. 7.) You will ask us about things you're unsure about. 8.) You will agree to the Terms of Service. 9.) When you contact any of us, you will be polite. 10.) You have NO rights to take any legal actions against us in any way. 11.) We're NOT responsible for rollbacks in any ways whatsoever, if you complain however, you'll be jailed. 12.) Edited WZ files of any kind other than the current SmootieMS WZ Files will not be allowed. 1.) You're not allowed to harass anyone in the community without good reason. 2.) As well as No Harassing, there will be NO Kill Stealing unless it's a joke and there is no conflict. 3) When a GM(Game Master) is dropping a prize for the winner of an event, it will be looted by the winner of the event. 5.) When a GM(Game Master) asks you a question you must respond. 6.) AFK training is not tolerated and will lead to a Pernament IP ban. .7) If you're placed in Jail and attempt to break out then we will ban you without warning. 8.) GM's(Game Masters) have all power over players to IP Ban or worse IF they break these rules or go against the T.o.S. 1.) Any content found on this site may NOT be used in the court of law. By viewing the website, you agree to the following: You are not in any way related, hired or employed by Nexon America, Nexon Corporation or Wizet in any way. 2.) All images and other contents related to MapleStory (c) are owned by Nexon Corporation, if you find such materials in our website, contact the admin to remove it. 3.) This website is only informative. It doesn't keep any images / files that are owned by Nexon Corporation, again if you see such things you may contact the Admin. 4.) 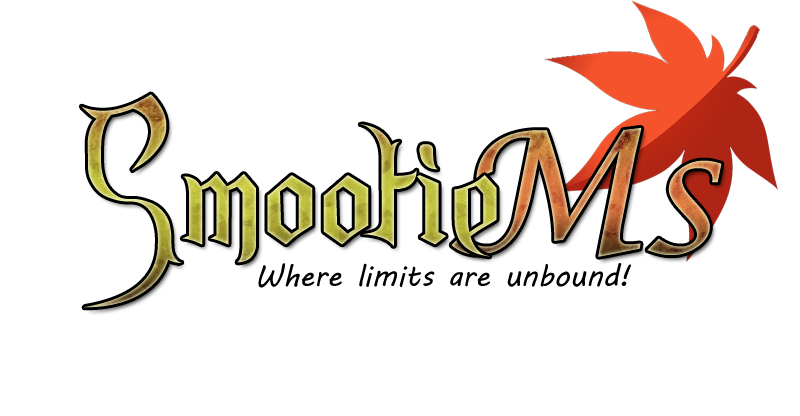 SmootieMS is a strict private community for gamers only, any other type of individual will not and can not register. 5.) SmootieMS is a free service that requires no payment of anykind, this is an open service for all who registered and agreed to this licence agreement. 6.) SmootieMS provides a free service but we accept DONATIONS to support our service from a user's free will, in return your effect and support towards the server we will reward the DONATOR, and only the donator one or more thank you gift(s), all DONATIONS made towards the server is non-refundable. 7.) SmootieMS reserves full rights to not send out donation gifts. 8.) SmootieMS is a free service we only have users, not customers. 9.) SmootieMS reserves the right to remove anyone's access to the SmootieMS service for any reason. 10.) Any user must respect everyone. THREATEN, HARRASSING, CURSING, OR ANY VERBAL ASSAULT towards any user is a top offence. 11.) Any user who were caught with any unauthorized 3rd party programs that directly/indirectly interfere with the gameplay of the server which allows the user to gain an advantage in anyway will result in a ban. 12.) SmootieMS carries no responsibility of your account's security, if you give out your password, you are putting your account in jeopardy of being stolen. 13.) You obey the game rules, found on our website at the rules page, caught breaking any rule may result in any sort of penalty. 14.) In any case of any user's access being removed from the server, staff members have the right to restore or not to restore anyone's account/data of their free will. 15.) If Any Information Was Disclosed To Any Corporation / Company Or Any Entity. It Would Violate The Terms Of Service Of This Website (Which Could Result In A Lawsuit). The Information Would Have Been Obtained Illegally And Is Not Admissible In A Court Of Law. If you do not agree to the T.o.S, You MUST leave IMMEDIATELY AND not download anything! If we catch you downloading ANY of our product and using WITHOUT our permission then we are able to do anything we want in your server. Sleepy we need a "Suugestion and Feedback Sections". Why? Because most of the players who played have their own suggestions so we need that section.